I like her coat and how she straddles the fine line between disheveled and stylish (though she definitely lands in stylish). 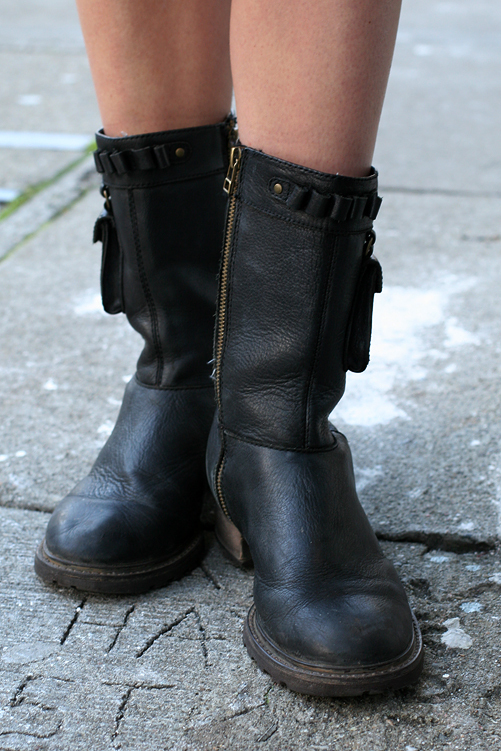 A look at her motorcycle style boots. I just discovered your blog and i find it great ! I just quitted the press industry to create 3 month ago a blog that shows Paris through street style photo romances. It's a new way for me to humanize fashion. I hope you'll like as much as people already like it. As i need feed back from all over countries and culture to improve my work, I'll be glad to have your opinion and why not share links to share our work and because i am sure that you share my vision : fashion is for sheep, whereas style gives personality ! ps : if you need some of my photos, I'll be pleased to help you. i own this coat! or, a coat that is really similar. i've had it for years & i love it!